Final Fantasy XIV developer Square Enix has officially announced the release of Patch 3.4 this coming Sep. 27. Otherwise known as Soul Surrender, it will bring in huge wave of new content additions to the popular MMO RPG. Officially called Soul Surrender, patch 3.4 will wrap up several of the currently ongoing narrative threads introduced with the game’s Heavensward expansion, which was released last year, including a conclusion to the current endgame raid and Ishgard’s war against the dragons. The current Final Fantasy XIV had an interesting road to launch. 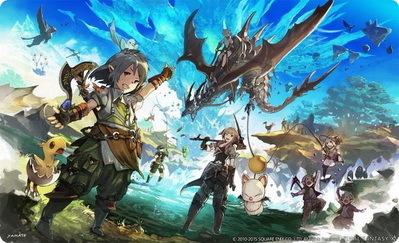 The original FFXIV came out in September 2010, and the reviews were so negative that the game was rebuilt into Final Fantasy XIV: A Realm Reborn , released again for PS3 and PC by the end of August 2013. This time everything seemed to gel right: the engine, story, gameplay, and overall structure of presentation was more than enough to keep gamers interested in playing. With the arrival of Patch 3.4 “ Soul Surrender,” Square Enix is looking to deliver on a big step forward for the game when this new update launches on September 27th. The third and final part of the Alexander raid – The Creator – is poised to be the set piece of Patch 3.4, bringing players face to face with the gigantic Primal for one final clash to decide the fate of Eorzea. Emerging from the battle victorious will reward you with new endgame gear as well as the ability to attempt the fight again in a more difficult Savage mode that offers even more lucrative rewards should you conquer it. Accompanying the above will be a new boss trial – Containment Bay P1T6 – which introduces the second member of the so-called ‘Warring Triad’ Primals: Sophia, the Goddess. Not everything introduced in 3.4 will be world-defining content, though. Several additions to existing features, including new Grand Company ranks, player-owned apartments and aquariums are all shown off in the above trailer, as well as two new dungeons – Xelphatol and The Great Gubal Library (Hard). Finally, Final Fantasy XIV will get an aquarium feature via this Sep. 27 patch. It will let gamers to fill it with fishes. The bigger it is, players can add as many fishes as they can. The center storyline is focused on a new threat approaching. But Soul Surrender has plenty of other attractions to keep you entertained. Apartment buildings have been added to wards and subdivisions. To obtain one, you need to be level 50 and have one class, in addition to having the rank of second lieuteant. A building can have up to 90 tenants, with rooms costing 500,000 gil each. You’re allowed to have both estates and apartments (but you can’t share apartments). If you want to add some life to your living space, you can make an aquarium in any of your properties with the fish you catch. Setting mood music is possible too, with the new Orchestrion interface feature. Some new dungeons await you in the expansion. The mountains of Xelphatol are inhabited by the Ixal, who seek to summon a being named Garuda who they want to strike down their enemies. One of the second dungeons is The Great Gubal Library. This hard mode dungeon isn’t just a place of knowledge, but also magical guardians who are bound to protecting the secrets within these halls. If the new main scenario doesn’t intrigue you, this new patch has further adventures of the Hildibrand, plus a side quest involving the Saint Endalim’s Scholasticate.